After a disappointing start to the season in Taupo a few weeks ago the event was called off after one day due to high winds and very rough water. A great line up of Grand Prix Hydroplanes for the 2019 season, leading the charge after the first round was “Fair Warning “ Scott Coker 500pts, “Annihilator Race Boats” Warwick Lupton 400pts, “Tiger” Chris Picard 325pts, “GP57” David Alexander 269pts,“Lucas Oils” Ken Lupton and “Lady Liz” Jason Haggerty both on 100pts. New to the field but not racing is Jason Haggerty who used to drive grand national boat “Miss Aberdeen” Haggerty Family have purchased the ex Steeler boat from David Alexander renamed and a bright new paint job the boat Is now called “Lady Liz” after Jason’s grandmother. A few teething problems with the shaft saw them miss the first race they have fixed the boat and a ready for Karapiro. “GP57” Penrite Repco boat normally driven by Jack Lupton for the first two rounds will be driven by David Alexander, David took to his first run in Taupo with a few throttle issues but overcame this and is looking forward to defending his title in this weekend’s Masport Cup. Missing from the Grand Prix line up is new comer to GP racing last season Steve Preece who recently purchased the “Annihilator GP008” also from Alexander. 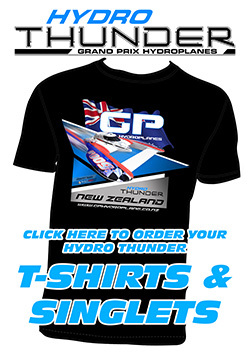 A delayed container out of Canada which has the new engine along with Ken Lupton’s new Bert Henderson built Grand Prix Hydroplane is now due to arrive in NZ beginning of March. Preece will miss the season but be ready to go testing at the end of the season, Ken Lupton who had also hoped to have his new boat ready to race this season will start putting the boat together as soon as it arrives and plans to start testing during the off season. “Gull Oils Gambler “Kevin Ireland missed the Taupo round but is burning the midnight Oil to get his boat to Karapiro. This weekend’s round at Lake Karapiro has an awesome line up of boats some 60 plus entries over several different classes, four North Island Titles up for grabs, Mod VP, Formula 3, the new Super stock Class and the Juniors, Marsh Motor Sport, and the comeback tour of the NZ Formula One Tunnels shaping up to be an awesome two days of racing. With racing starting 10am both days a full race program of 24 races each day the major North Island titles will be run on the Saturday along with the Marsh Motor Sport and the first heat of the AE Baker Australian Hydroplane Championship scheduled for 3pm. Sunday another full day you will see Grand Prix Hot Laps at 11am with the final heat of the AE Baker at 12.30pm. The final two rounds of the NZ Formula One Powerboat tour 11.45 and 1.45pm, and the two heats of the 94th running of the Masport Cup at 1.30 and 3pm. Plenty of other support class racing to keep you entertained.